You can use any red Jell-O powder for this; I tried cherry and raspberry and liked raspberry better, although cherry was a paler pink. 1Put the popped popcorn in a large bowl, carefully picking out any unpopped kernels. (I do this by popping into one bowl, then lightly scooping out the popcorn with my hands into another, leaving the unpopped kernels in the bottom.) Preheat the oven to 250F. Line one or two rimmed baking sheets with foil. 2In a medium saucepan (with room for the mixture to at least double in size), bring the sugar, Jell-O, water and butter to a boil. Once fully boiling cook for 4 minutes without stirring, swirling the bowl occasionally. Remove from the heat and stir in the vanilla and soda. 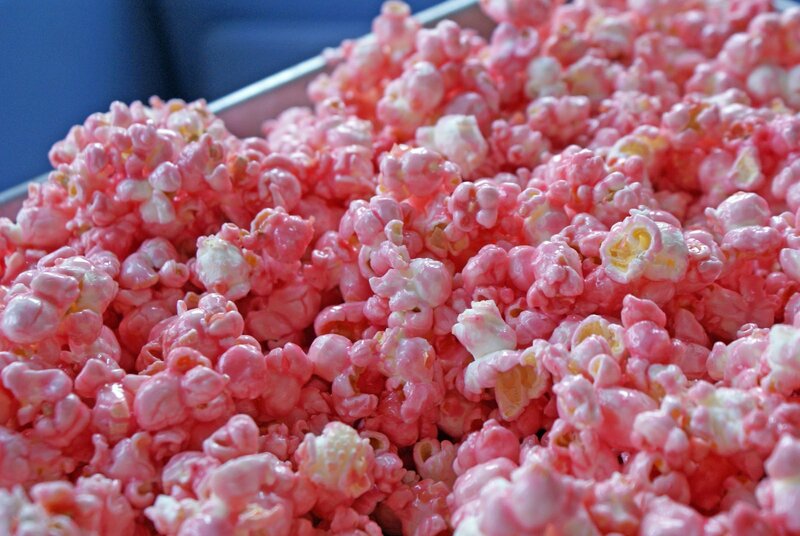 Pour over the popcorn and toss with tongs to coat completely. Spread out onto the baking sheets and bake, stirring once or twice, for an hour. 3 Set aside to cool.